We are a retail store that specializes in BBQ's both gas and charcoal plus smokers, Patio Furniture, Outdoor Kitchens, Gas Logs and Fireplace accessories. We have a great selection of BBQ accessories, sauces and rubs plus all kinds of woods for smoking. We carry the following lines-Big Green Egg, Weber, DCS, MHP, Kalamazoo Outdoor Gourmet, Firemagic, Ace of Hearts makers of The Good One, and Cookshack. In gas logs we carry R.H. Peterson. We also host grilling classes, wine dinners, and private parties. Our store is unique setting for your next party. In the summertime we have a wonderful outdoor patio so we can host your party outside. We have 2 TV's inside and 1 outside so our store is a great place to host a party to cheer on your favorite team. We always have 2 great micro brews on tap and a fine selection of wines. 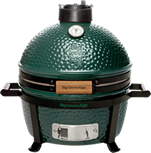 The Big Green Egg is a blend of ancient tradition, modern technology, and proprietary processes, resulting in a far superior product that is stronger, more durable and provides better heat insulation than any other outdoor cooker on the market. That's how the Big Green Egg works so efficiently!